У блозi Арт Клуб UA знову нове завдання. За вікном уже починає панувати осінь, а ми команда Арт Клубу запрошує вас ще трошки залишитися в літньому настрої із новим завданням "Спогади про літо". New Challenge started at Арт Клуб UA blog - Summer memories, and with the challenge our team would like to invite you to meditate about your summer even though fall is already here. Для мене літо - це час подорожей: близьких і далеких, довгих і коротких, літаком, машиною чи навіть ровером... Саме влітку ці подорожі найцікавіші, найбажаніші та найприємніші! Тому для своєї листівки я використала штамп від Saturated Canary Pack Light та розмалювала його маркерами копік. For our family summer is time of many different travels, long and short, far and near. Not that we do not travel in other seasons, summer is best for all the little trip, cause you can pack pretty light and just go somewhere for a day or two, or even couple hours. У листівці я використала набір паперу ММЕ Follow Your Heart - Be Amazing, стрічку washi, квитки від Тіма Гольца, ножі Спелбайндерс Decled Rectangles та дерев'яні прикраси від Studio Calico. Розмальоване зображення я вирізала й посадила на листівку за допомогою об'ємних квадратиків dimensionals від Stampin' Up! For my card I used Pack Light image from Saturated Canary. 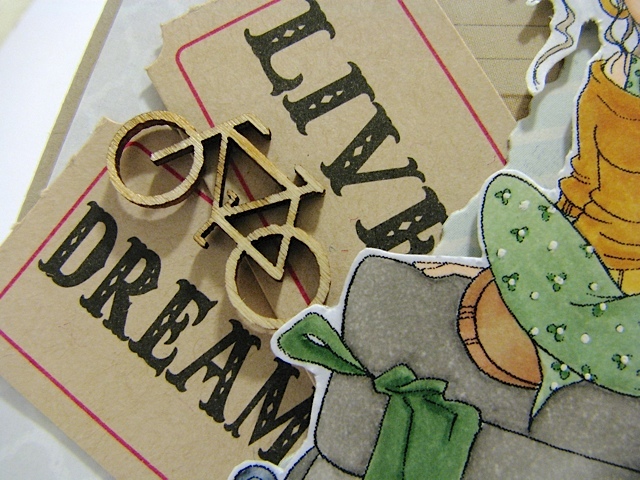 Paper set is MME Follow Your Heart - Be Amazing. 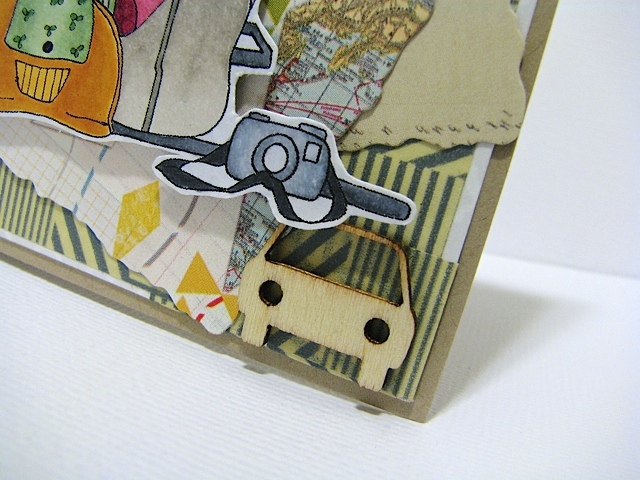 I used some washi tape on the edges and added wooden plane, car and bicycle by Studio Calico, and couple ticket by Tim Holtz. I coloured my image with copic markers, cut it out and adhered using dimensionals by Stampin' Up! I also used Spellbinders Deckled Rectangles Die Set. Напис я використала той, що був на самому папері: не всі ті, хто блукає (мандрує), загублені. Sentiment is on the paper I used. It worked perfectly for this card and the theme. Лілю, ця листівочка така суперова!! Ціла історія придумується, розглядаючи її! Классная открытка. Такая себе дама на чемоданах, очень понравилась. В ней такое интересное чувство - как будто в предвкушении чего-то классного, каких-то хороших перемен, не знаю даже почему). Очень клевая и стильнущая! Спасибо за участие в задании блога Paint Your World ! Fabulous card, great embellishments and wonderful layout. 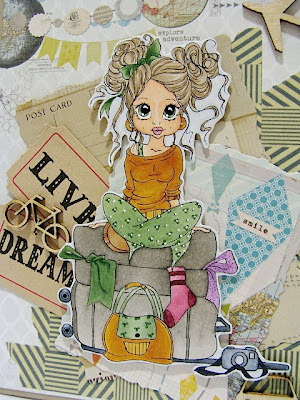 Love the LO of your card! Fabulous coloring! 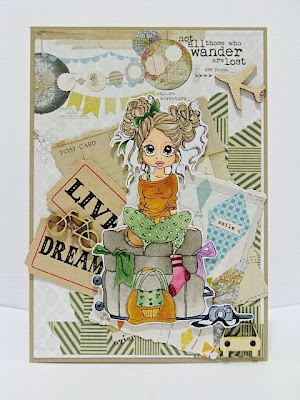 Super design and I love all your embellishments. Thanks for joining us at Crafty Boots Challenges this time. Lovely coloring and I really like all your details! Thanks for playing along with us over at ABC Challenges! 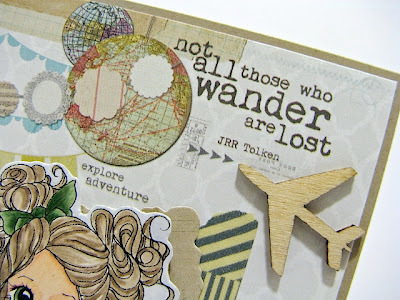 This is stunnning and a good play on our theme of "Things with wings" over at Crafty Bloggers Network. What a cool collage card, love the fresh colors! That reminds me I should start making my vacation album, too. LOL I would like to thank you for entering my 'C... is for challenge' blog and I wish you good luck in the draw. I can see you had a good summer from the great card you have made. I love the image you used and you have coloured her beautifully. Thank You for sharing with us at Lady Anne's Challenges. I hope we see you again soon.